’70s costume contest winners. Photograph provided by Rebecca Reese.One of the many great things about sororities and fraternities is that they host events and fundraisers for great causes. Last Friday, Wright State sorority Alpha Xi Delta held their annual Roller Disco fundraising event for the Autism Speaks organization. “Alpha Xi Delta college chapters and alumnae associations promote understanding and acceptance of autism and raise and funds by participating in various Autism Speaks Walk events across the country and holding AmaXIng Challenges at our host institutions. With 1 in 59 children diagnosed with autism and no known cure, Alpha Xi Deltas are committed to improving the lives of children and families affected by autism,” according to Alpha Xi Delta’s website. “We need to understand and be more appreciative of those who struggle with things that we find relatively easy,” added Rebecca Reese, philanthropy president of Alpha Xi Delta. Having partnered with Autism Speaks for almost a decade, Alpha Xi Delta works hard to bring awareness to Autism and life on the spectrum. Aside from the fundraisers that are held, the Nutter Center is lit up blue during April for Autism Awareness Day. “Partnered with Autism Speaks [since 2009], our organization as a whole reached nine million dollars total that was donated,” said Reese. 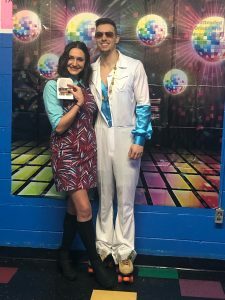 Roller Disco is Alpha Xi Delta’s biggest event throughout the year, selling almost 200 tickets and raising $1,528 to donate to Autism Speaks. This year’s event included a ‘70s themed costume contest, photo booth, roller skating, music, raffle baskets and $25 gift cards to El Rancho awarded to two winners. “[Alpha Xi Delta embodies] courage, graciousness, peace and realizing your potential. Joining this chapter has inspired me to reach out to more people, be a better person and has made me a better leader. I feel like I have a home on campus; it changed my college experience and made me a better person,” said Reese.